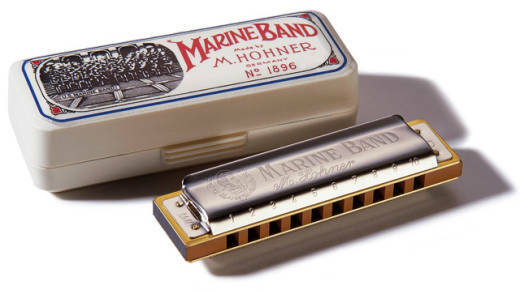 The one, the only, the original -- the harp that was there when harmonica blues was born. Made famous when played by every serious harmonica player from Little Walter to John Lennon, Paul Butterfield to Bruce Springsteen, Neil Young and many, many more. The result of over 100 years of tradition and German craftsmanship, it is still the number one choice of top professionals and the most recognizable model all over the world, known for its full tone and wood comb. Play the Marine Band and be a part of history. Available in 8 major keys. Had same problem with comb swell. Ended up having to sand down and reseal. Even with problem fixed, It becomes uncomfortable to play for long periods. Some reeds are a bit out of tune especially on the draw, but I cannot recall if it was like that when it was new. When it is not frustrating you, it does sound great. Very easy to play. Plays great and sounds great. My only problem is that after playing for an hour or two, the comb would swell up so bad I couldn't play anymore. After pulling it apart and soaking the comb in butcher block oil, the problem has gotten much better. I would recommend this harp to anyone, with the information on comb sealing.